Novelty yarns are yarns that are designed with a special effect. This can be in the form of a thin reflector strand in the yarn, and you could for example knit or crochet a hat, shirt or vest that would make you more visible in traffic. 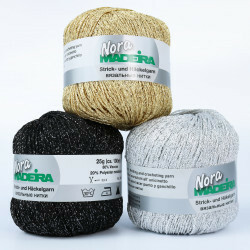 It can also be a glitter thread that you add to your yarn project to achieve a glittery effect. The great thing about knitting or crocheting with a reflective thread is, that the reflection is not seen in daylight, but only when darkness falls, and therefore it doesn’t affect your various patterns in a negative way. 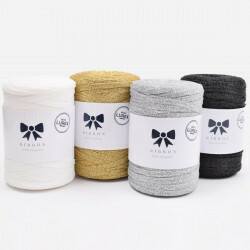 There are many different versions of novelty yarn, so you can choose whether to use reflective yarn, reflector strand or glitter thread. So, you decide how big the effect should be on your crochet or knitting project. In the long, cold winter months, novelty yarn is close to being your best friend. If you are one of the many people who daily go to work or school while it’s still dark outside, the reflective yarn or even the reflector strand can help you be more visible in traffic. It would also make sense to crochet or knit hats, mittens, sweaters, vests or scarves for your children, so they also are more likely to be to be seen in traffic. As mentioned above, novelty yarn is very suitable for making yours and your children’s movements in traffic safer. Some may think that it's unnecessary to crochet sweaters, vests, scarves, etc. 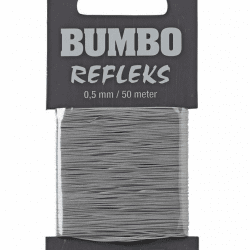 with reflective yarn for their children, as most children often have a reflector on their jacket. However, this could become covered by a backpack or a scarf and with a crocheted or knitted hat made with reflective yarn, this is no longer a worry. But, this is not just about traffic safety, so we would also love to tell you a little about our glitter thread. Our glitter thread can help add some extra colour to your day, or just give a little oomph to a slightly boring shirt or blouse. The glitter thread can be found in both gold and silver, so whether you like one or the other, we've got something for you. 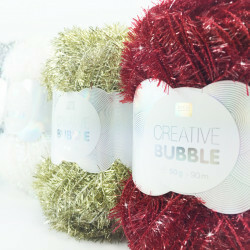 At Hobbii.dk we strive to be one of the best and fastest at delivering novelty yarn and yarn accessories. Therefore, you will always get your parcel within three business days of ordering online. We take pride in keeping a high standard in our customer service department and please don’t hesitate to give us a call if you have questions about our products. We always provide full right of return on goods ordered on our web shop. You are always welcome to contact us if you have questions about our novelty yarns or need help ordering. You can contact us via our contact form and we will respond to you as quickly as possible. Or you can call us on 0045 31 86 33 57 or email support@hobbii.com. We look forward to welcoming you as our customer. I love love love the quality of this yarn. Is easy to work with and the colors are very intense. I will he ordering it again and again ! I am making a Christmas garland and this yarn will provide the glitz! It was just what I've been looking for. Wow just wonderful scrubby yarn...its my favorite...very easy to crochet with..